Crafting Suite is a follow up on my original mod, Project Bench. It brings back the Project Bench, but also expands upon the original idea of it. Now the player will be able to have a more personalized experience with the benches in their world, both functionally and aesthetically. You’ll have access to many things, from crafting benches that will hold onto their inventory rather than drop it, and benches that will have additional storage space that they can craft from. Once you decide on the modifiers to add and are ready to craft, you may want to hold shift over the Craft button to see what the table is going to consume in its recipe. 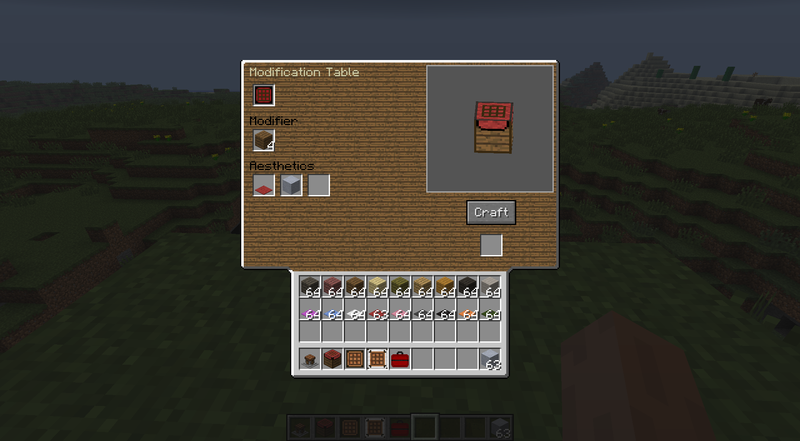 Now you may click craft and the table will get to work on crafting, it takes about 10 seconds to craft. During this time you may gaze fondly at the render in the bench, or take a step back from the table and watch as your new bench rises triumphantly from the table. Or just space out and not enjoy those features which I put effort into. – Hold shift over the Craft button to see the recipe it’s using. – Extraneous items in the inventory may hinder your crafting ability. – You won’t be able to craft another bench if there is a result still in the slot that differs from the new recipe.